Equipped with 4 small nodes and 4 large nodes, this device delivers a deep tissue massage to just about every part of your body. The bi-directional movement control mimics the motion of professional massage therapy and auto-reverses every minute for improved distribution of massage effects. The AC adapter tends to heat up after some time. InvoSpa neck massager is as close as these devices get to an actual in-person massage experience. For a price of about 2 trips to a massage parlour, you'll get years of quality 3D shiatsu kneading in the comforts of your own home. Plus, the travel bag makes for easy storage and transportation. Using a dust guard cloth that wraps the part where the nodes come in contact with the body, the model protects you from the mesh friction and its circuitry from dust. With its ergonomic U-design, the massager does a great job contouring the shape of your body parts to maximise the efficiency of the overall experience. With the heating mode activated, the model gets a little noisy. 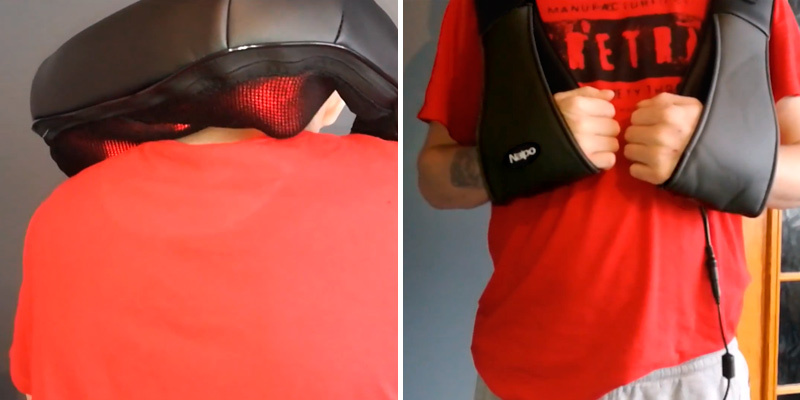 Naipo Electric is a functional and powerful neck massager, there's no two ways about it. But what we really like about the model is just how effective it is. With its functionality and ergonomic design, you'll be able to target and heal every part of your body without leaving the premises of your home. A versatile adjustable Velcro strap will secure the cushion to your favourite office chair for a relaxing break or to a car seat for a deep tissue massage on the go. Massage heads rotation direction is not adjustable. 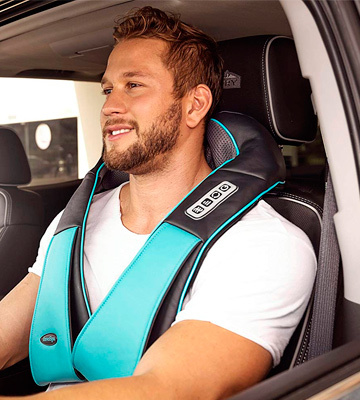 With an incredible Comfort Supplies cushion massager, you can relieve knots, muscle tension and stress while you are at home, in the office or even in a car. A portable design makes Shiatsu kneading available and affordable to anyone! Massage nodes rotation speed and dual massage directions are perfectly tailored for you to get maximum pleasure and relaxation as if a hand of a pro kneads every sore muscle of your body. An auto switch-off period is rather short. Now you don't need to find time in your tight schedule to visit a massage parlour anymore since this ingenious Amzdeal massager offers unmatched portability and convenience. You only need to switch it on to dive into delightful relaxation of a soothing therapy. 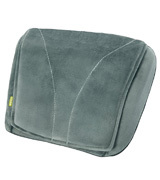 The pillow is very compact and easy to carry around. A good option for use both at home and on the go. The cord is not very long so you might need to use a power strip. 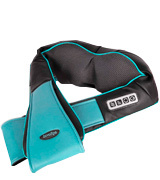 The HoMedics SMP-22-GB is a versatile solution suitable not only for neck and shoulders but also for a full body. All that you need to do is apply it to an aching body part and it will bring relief almost in an instant. As a rule of thumb, neck massagers seldom rival massage chairs and those don't really hold a candle to professional masseuses. But this model from InvoSpa is a little different. Now, we aren't saying that it will be able to 100% replicate a professional massage therapy but it is about as good as neck models get. 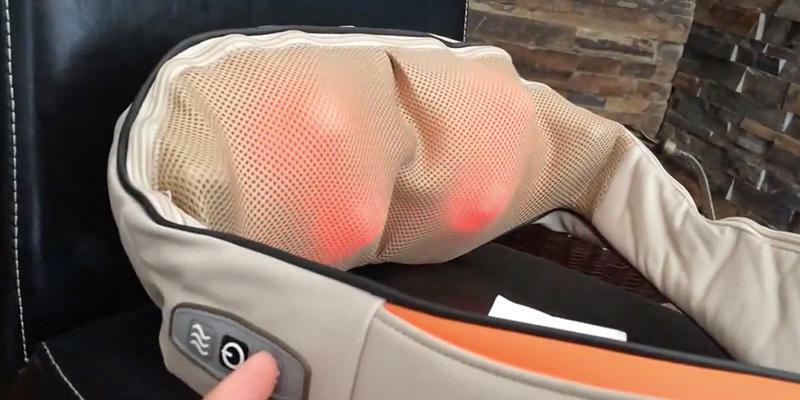 Equipped with 4 small nodes and 4 large nodes, this device just as well delivers a deep tissue massage to your neck, shoulders, upper back, and lower back as it does to your waist, thighs, calves, arms, legs, and feet. With it, you'll be able to achieve full-body recovery by releasing stress and relieving sore muscles. Of course, that's not all of it. On top of the nodes, the model incorporates a heat function. Utilising infrared heat, this thing works wonders easing muscle tension and promoting blood circulation. But, first and foremost, what makes this massager better than most of its counterparts is the bi-directional movement control. 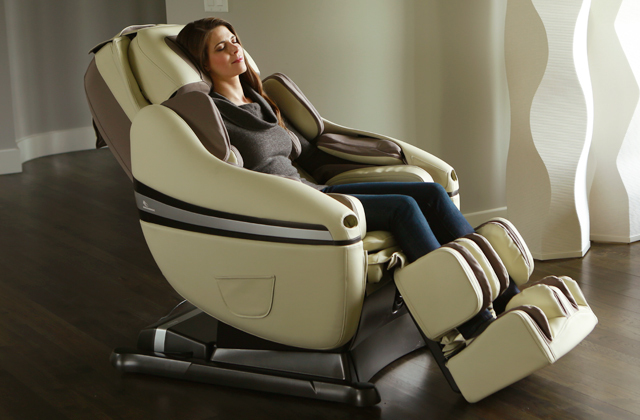 Mimicking the motion of professional massage therapy, this thing allows you to reach a whole new level of relaxation. 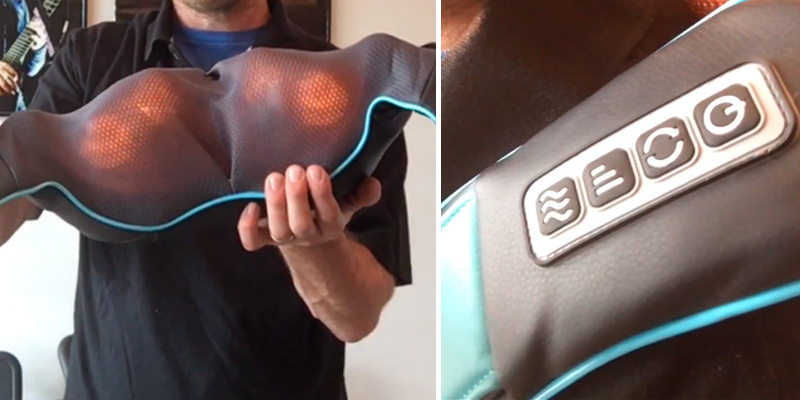 Furthermore, it auto-reverses every minute for improved distribution of those massage effects. Again, the InvoSpa neck massager is as close as these devices get to an actual in-person massage experience. For a price of about 2 trips to a massage parlour, you'll get years of quality 3D shiatsu kneading in the comforts of your own home. From a technical/performance standpoint, Naipo Electric does not trail behind anybody. But we will get to that in a moment. First, let's talk about just how comfortable and practical this thing is. 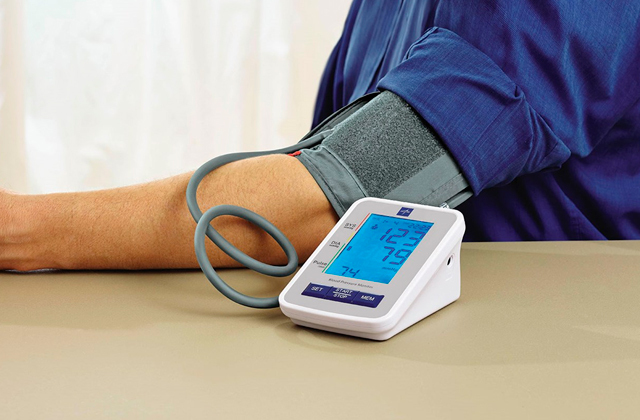 With its ergonomic strap handles, you'll be able to effortlessly pressure and adjust the device in a way that will allow it to target the most hard-to-reach areas. Equipped with a dust guard cloth that wraps the part where the nodes come in contact with the body, the model protects you from the mesh friction and its circuitry from dust. With its no less ergonomic U-design, the massager does a great job contouring the shape of your body parts to maximise the efficiency of the overall experience. Now, as far as its functionality is concerned, there isn't much here that you haven't seen in other high-end neck massagers. 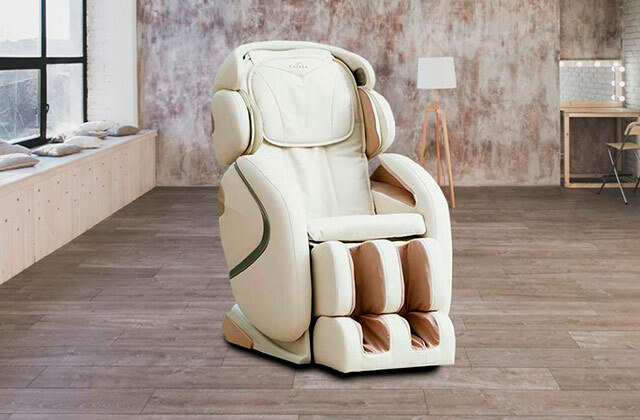 With its 8 massage nodes, it is able to replicate that deep tissue shiatsu massage that really gets to the crux of your matter, alleviating pain, reducing muscle tension, and providing a full-body relaxation. The heat function will allow you to heat those nodes to about 40-45 degrees Celsius. This way, you'll be able to improve the overall efficiency of the device, as well as increase blood circulation and comfort your sore muscles. For safety reasons, the model incorporates a 20-minute automatic shut-off function. Aside from the aforementioned straps, you'll get 3 different speed settings. These settings, along with the straps, will help you figure out the perfect intensity and overall customise the experience according to your own preferences. In closing, the Naipo Electric is a functional and powerful neck massager, there's no two ways about it. But what we really like about the model is just how effective it is. With its functionality and ergonomic design, you'll be able to target and heal every part of your body without leaving the premises of your home. Long-distance trips, even in the most comfortable bus, train or car, are always associated with fatigue, strain and pain in the neck and back area due to long-term sitting. Comfort Supplies offers an excellent solution to avoid a feeling of discomfort and enjoy your trips! 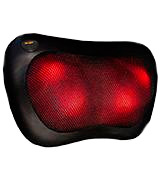 It's an incredible Shiatsu massage cushion with an infrared heating function. 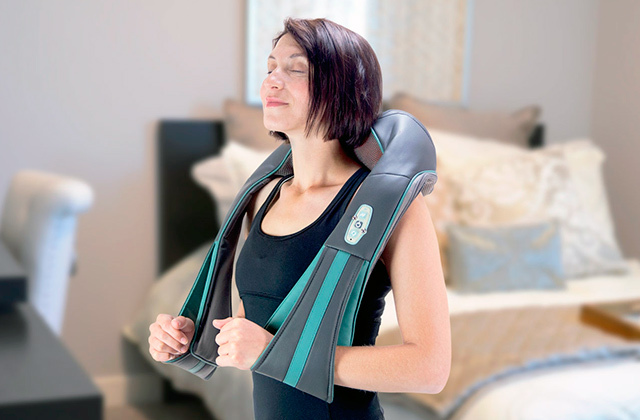 Rotating Shiatsu nodes target acupoints in your neck, upper and lower back to break the knots, relieve aches, tension and stress, while infrared heating promotes blood circulation to soothe strained muscles. 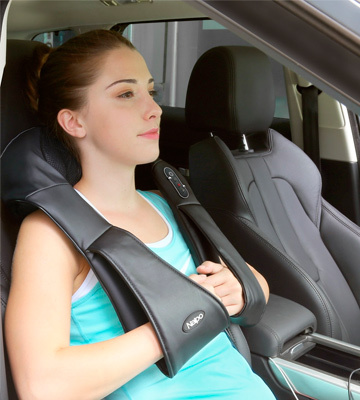 With a special adjustable Velcro strap, you can easily attach the unit to your car seat or any armchair at your home or in the office to enjoy a delightful Shiatsu kneading without distracting from work. Furthermore, this massager will also come in handy to alleviate a radiating pain down your legs after a hard and busy day on the go. A compact yet functional and efficient unit will become a lifesaver, bringing the desired comfort and long-expected relaxation to your tired body while at home, work or during travel! If a massage pillow takes care of your body, a face brush is designed to give your face a healthier look. A microcurrent technology boosts skin cells renewal for your skin to look younger and more attractive. Add this ingenious unit to your beauty arsenal and discover all the benefits of a face brush. If you spend most of the time on the computer, you're likely to need a good neck massage. The good news is, you don't necessarily have to visit a massage therapist. 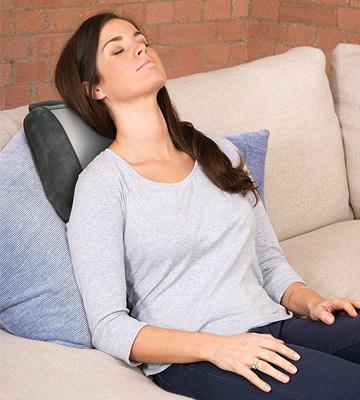 This magnificent scarf-shaped Amzdeal massager can come to help! The shape of the scarf allows using it almost in any position, even if you were lying on a coach. 8 massage heads can deeply knead your tough muscles like thumbs and knuckles of a professional masseuse. Amzdeal massager works well on affected body areas, including neck, shoulders, back, lower back, legs, hip and even abdomen. It will knead and restore sore muscles, improve blood circulation and take off fatigue in a matter of minutes. Meanwhile, all athletes and active people who are fond of sports will appreciate a heating massage function that adds a warming effect and offers a soothing therapy, reviving your body after workouts and increasing your muscles and ligaments elasticity. For your ultimate comfort, massage rollers are covered with a soft-to-the-touch fabric to prevent skin irritation while hand grips allow you to customise the pressure and massage intensity to your personal needs. Have no time for the SPA or manual therapist? Not a big deal! Amzdeal Neck and Shoulder Massager will become your personal masseuse that you can always have at hand. 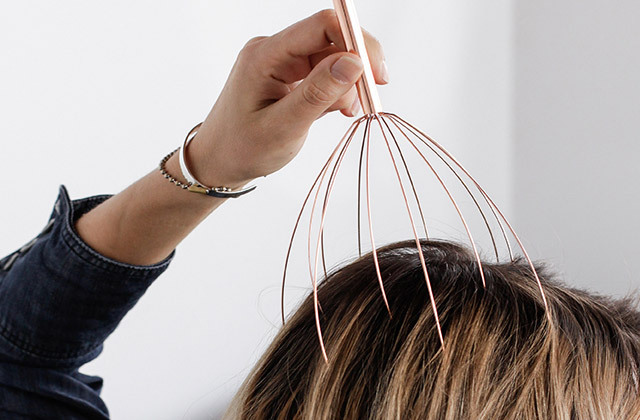 Another easy and affordable way to relieve tension and shake off stress is to use a head massager. This simple yet efficient device will quickly energise your mind and body. 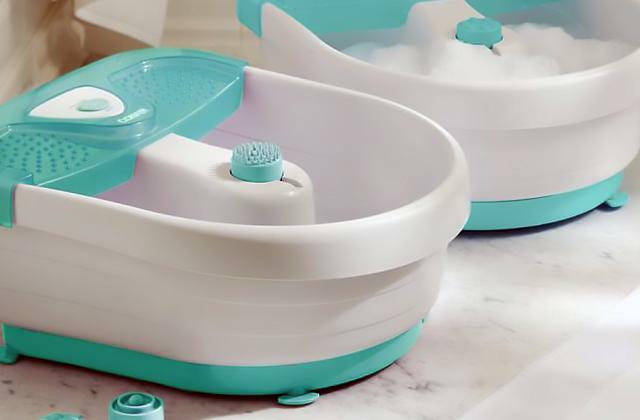 Since its establishment in 1987, the HoMedics company has remained to be the leader in massage technology, producing high-quality home accessories for quick pain relief. The SMP-22-GB pillow is one of its unique products, which has a wide range of features and benefits we'd like you to consider. Thanks to its portable design, you can comfortably use this massager on the go, take it with you in your car and use it at the office. It comes with a handy adjustable strap, allowing you to attach it to the seat of your vehicle or chair in the office. 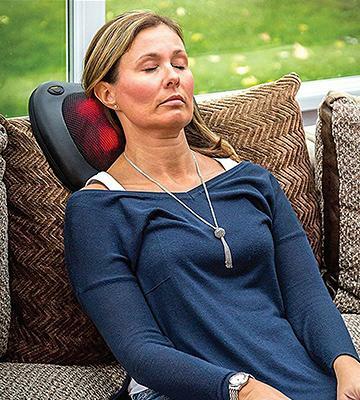 Using the SMP-22-GB pillow massager for neck and shoulders you will soon notice that many of the problems you had with your back and neck area will disappear as if they've never really occurred. Fitted with massage nodules and with a heating function, the SMP-22-GB can dig deep in your muscles to brush off stiffness and discomfort that was giving you knots and stress. Customers who've been using the SMP-22-GB for a while say that each massage session with this model feels like visiting a professional Shiatsu massagist. The massage it provides is so good they don't want to spend a day without it. Along with amazing massage sessions, the SMP-22-GB offers some great convenience features. For starters, it is lightweight and very compact and you will not strain your arm muscles even if you hold it up for some time. Another one is that it comes with a remote control, which ensures greater comfort when you need to massage hard-to-reach body parts. The option to change massage direction adjusting the nodules to work either forward or reverse adds up to the list of its benefits, making the SMP-22-GB a decent candidate to consider. What Is a Neck Massager? It's common knowledge that all body systems are interconnected. Normally, fatigue, tension and neck pain are caused by a twitch or an awkward body position for an extended period of time. This is particularly true for people who lead a sedentary lifestyle and spend too much time at the computer day-after-day. To make things worse, discomfort in the cervical spine may lead to disease progression. Therefore, a delicate and effective massage of the cervical region will become an excellent therapeutic and preventive measure to keep your neck healthy. But what if you've got no time or opportunity to visit a massage therapist? This is where a good neck massager helps! A neck massager is easy-to-use at home; all you need to do is switch it on and target it on an aching body area. The rollers will start to rotate, effectively massaging stiffed muscles. This way, you will not only reduce fatigue but also achieve a total body relaxation. If you have a restless legs syndrome in the evening, it's worth considering using either foot massagers or back massagers which can help relieve tension in your spine. If you've come to a decision to buy a neck massager, you should primarily pay attention to the Shape and the Construction of the device. 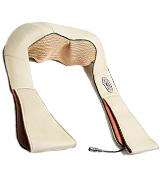 Traditionally, neck massagers come in scarf or pillow shapes that fit your neck perfectly. The main benefit of scarf massagers is that they can be easily used in multiple body positions: sitting, lying, and even standing. Owing to convenient handles, you are able to control the desired massage intensity on your body for maximum comfort. Meanwhile, pillow neck massagers are more comfortable to use while lying or sitting. Indeed, it's a real pleasure to enjoy a massage, sitting in your cosy armchair or in the car seat while driving. According to the construction, massagers are differentiated by the number of kneading massage rollers, generally ranging from 2 to 8. Typically, massage intensity and efficiency greatly depend on the number of rollers. The other important features that should be taken into due consideration when choosing a neck massager are the Types of Massage and the Body Areas. There are plenty of massage types to choose from: warm, vibration, deep-kneading, tapping, point, acupuncture, etc. When it comes to the warm massage, this technique will help you relax, relieve muscle fatigue, and prevent diseases, such as arthrosis, osteochondrosis, and others. The vibration massage technique is gentle, which is best suited for weak elderly people, especially those suffering from osteoporosis. The warm massage is also very useful, as it makes muscles and ligaments more elastic and less injury prone. Furthermore, such massage improves blood circulation and promotes deeper relaxation. 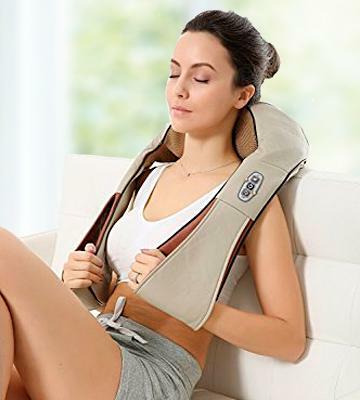 The great news is that some neck massagers are designed not only for a neck massage, but also can be used for an effective massage of shoulders, back, waist, legs, and belly. Next, you should take into account the Features and the Usability of your massager. The presence of an internal rechargeable lithium-ion battery allows you to use the massage device on a trip or on a landscape. An Auto Shut-Off function not only protects the device from overheat but also eliminates the risk of leaving the device on for too long in case you accidentally fall asleep during use. 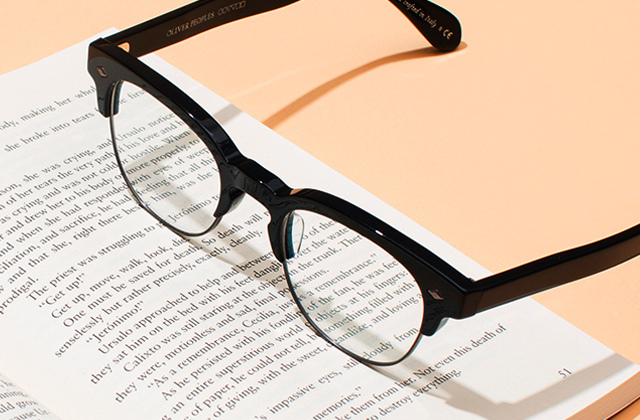 Some models have speed modes that can be adjusted to set the one that best suits your body. The shut-off buttons enable you to select the preferred massage type, which is also very handy. The supply package includes a car adapter, which allows you to enjoy a massage not only at home but also in a car. Additionally, a stylish carrying case ensures safe and sound transportation of the device. 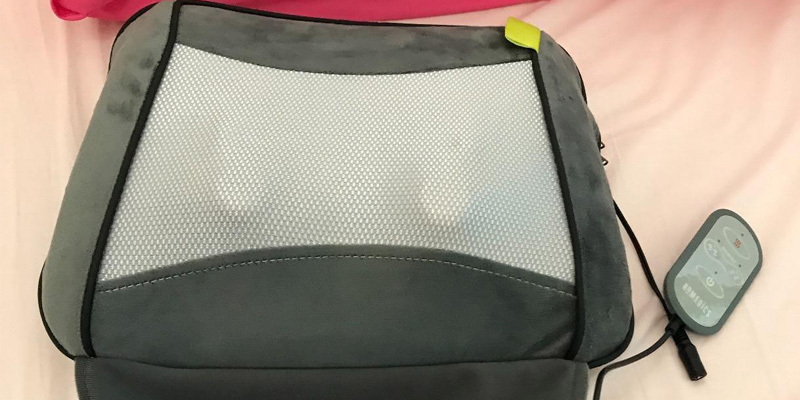 Besides, some models have the voltage in the range of 110–240 V. Thereby, you can take your massager with you anywhere on a trip, even to a foreign country. 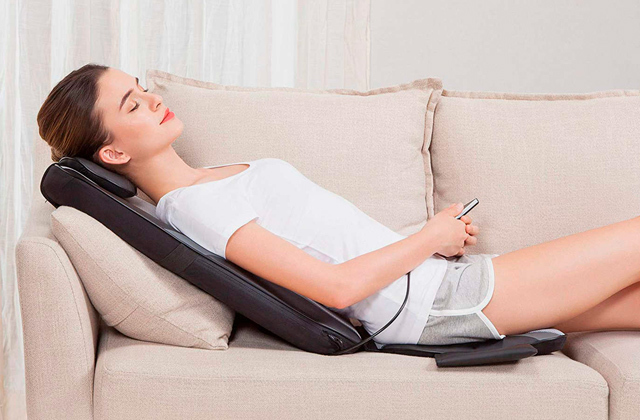 As a matter of fact, the massage device has been designed to be comfortably portable. So, the light weight of the neck massager is its undeniable advantage. All the above-mentioned features are really essential when it comes to choosing an important device for your wellness, such as a neck massager. 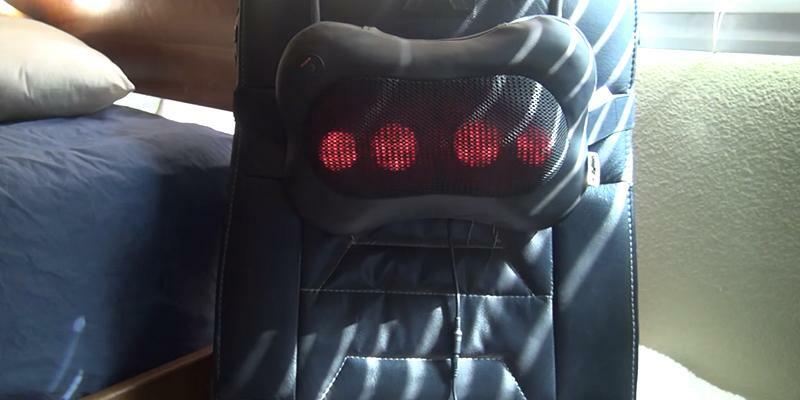 This neck massager review provides comprehensive information for you to make the right choice. 1. Shelley Frost What Are the Benefits of Full Body Massage, LIVESTRONG. February 03, 2014. 2. Massage, Wikipedia. November 26, 2016. 3. Melanie Pinola What's the Difference Between All These Types of Massages? Lifehacker. February 13, 2014. 4. How to give yourself a neck and shoulder massage, Daily Mail.